Why is it important to be a good role model? Chicco, leaders in baby products for over 60 years, announce the all new worldwide first – the Baby Hug 4-in-1. Distributed by Prima Baby in South Africa, Chicco are fore-runners in innovation and function when it comes to baby furniture, juvenile hard lines such as travel systems, prams and car seats as well as all other nursery essentials. For this reason, the world has gone crazy for the latest in evolutionary baby care – the Baby Hug 4-in-1. 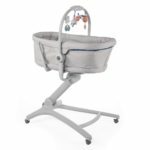 A crib, recliner, table chair and highchair in one, the Baby Hug is the only piece of furniture on the market that can adapt to become each of these items with a simple gesture. With brakes, wheels for moving from room to room and a musical, movable mobile to keep baby entertained, there is no part of your baby’s day that doesn’t need a Baby Hug. In fact it can even be adapted to the height of your bed to make a cosy co-sleeper for nursing moms. Having won several innovation awards in Europe throughout 2018, the Baby Hug has been received incredibly well by the international market, making it one of 2018’s most purchased items of baby furniture. We are proud to announce that Chicco is the only company in the world that sells the Baby Hug 4-in-1 and that it is finally available in stores across South Africa, including Baby City, Babies R Us and online vendors such as www.takealot.com and www.loot.co.za. Make life easy for parents and babies with the Baby Hug 4-in-1. Suitable from birth to 36 months.